Happy St Patrick’s Day – Have some cake! (and possibly some Guinness to wash it down with! )How will you be celebrating or do you not bother? I’ll be going to a cookery demonstration tonight with WI pals and maybe persuaded to pop into a local pub afterwards. I made this cake yesterday and there’s still plenty left. 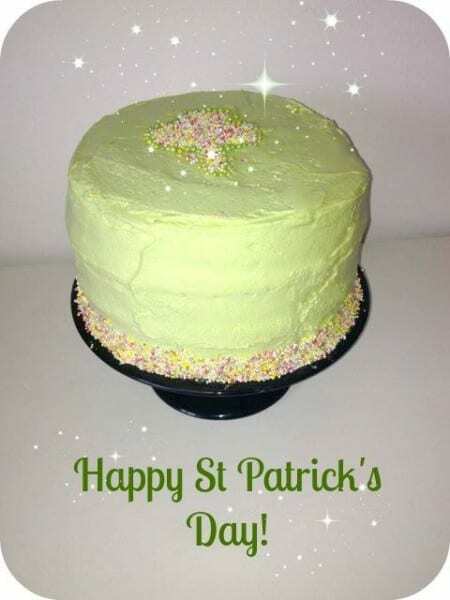 Its not a particularly irish recipe in that its a vanilla sponge cake but I have given a nod to the Emerald Isle with green frosting and a sprinkle shamrock on the top. Doesn’t stop it tasting gorgeous though and somehow it seems to last longer than other vanilla cakes. I swore I would never share my vanilla cake recipes but quite honestly, its easier for me knowing where they are, when I need to make one. So go for your life …bake and enjoy! This is a big cake. You will get 3 good sized 8" cakes out of this mix. The recipe can be halved by using 4 medium egg whites. Using an electric mixer, cream together the sugar and butter until light and pale. Add one egg white at a time, whilst mixing thoroughly. Keep scraping down the sides of the bowl. Alternately, add one tablespoon of flour and a decent splash of milk, whilst still mixing together on a slow speed,until all the ingredients have been added. Scrape down the sides of the bowl one last time and turn the speed to high for approx 15 seconds. It will splatter and bubble so prepared! Pour into 3 x 8" lined cake tins and cook at 180C for around 40-50 minutes or until a cake tester comes out clean. This is quite a flat mixture - it won't rise too much or give a big hump in the middle. I am starting a new linky this week to replace Cake of the Week. A lot of my baking recently has been bread, biscuits and traybakes and I see some fantastic creations on blogs that I would love you to share. The only rule is that your Bake has to be from the previous week. Your cake looks beautiful and soft inside. I don’t bake every week but I’ve just linked up my fruit scones. This cake looks stunning!!! I can never get a vanilla sponge just right so might be trying your recipe out soon. Looks great! I’m going to try and join in with this Linky – my baking needs some improvement! I’m here to help, Karen! I’m also here to test any of your creations! That looks really scrummy – bet it was gone in a flash! I do love a good cake! We don’t have an electric mixer which really does make baking quite tricky! Once again this looks amazing. 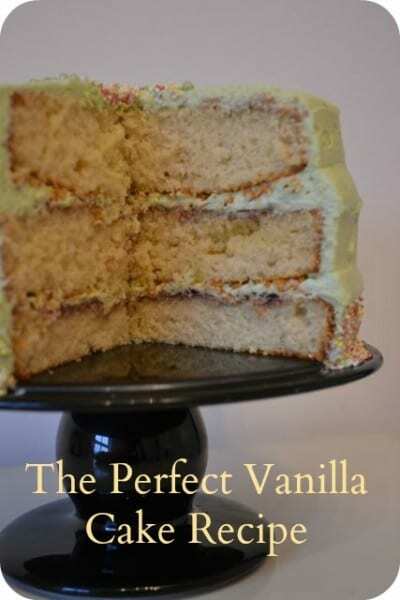 And as an American I can use a good vanilla sponge recipe – my husband loves it! Hope he likes this one, Erin! I always think of this recipe as my ‘American’ sponge cake recipe though – no idea why, it just reminds me of American based desserts I’ve had. oooh now that looks delicious! We don’t celebrate St Patrick’s day but we do celebrate the fact that we became a couple on that day (13 years ago now!) and it was randomly at Pippa (Red Rose Mummy)’s other half’s birthday party! What a tasty looking cake. So seasonal and it looks really moist inside. Oh that looks pretty, and very tempting too! Thank you so much for taking the time to link up to this months Tea Time Treats!